Like many of you, I'm sure, I've been trying to get the garden cleaned up for fall. I don't deadhead everything because I like to leave some seedheads for the birds, but I try to get the undergrowth and other detritus out to keep things aired out over the winter. The other day I was out there, looking around to see what else needed to be tended to when I noticed this lovely sunshine spilling across the little table in the (thing-I-euphemistically-call-a) gazebo. You may remember the gazebo "thing" from when I swapped it's chairs back in July. I wished I'd had a quilt to cozy up in that shaft of sunlight and read for the afternoon. Of course the table is dirty and there are weeds everywhere (don't look too closely! ), but I still love this little corner. 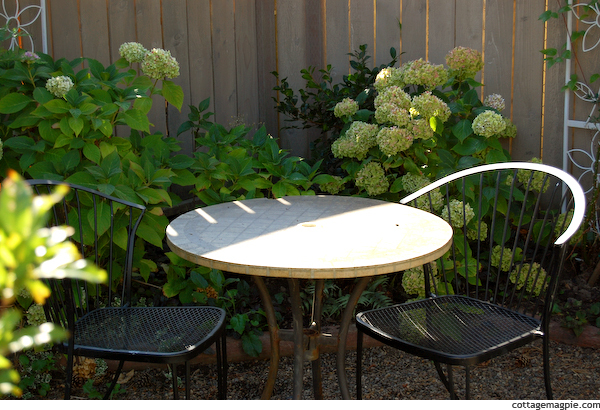 I think I might actually have room for one more hydrangea, too, between the climbing 'New Dawn' rose and the Geranium phaeum. 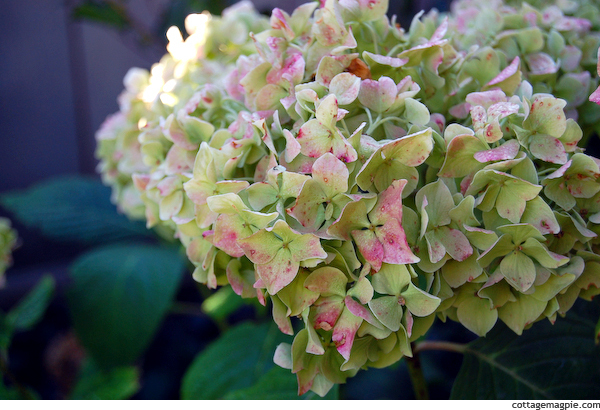 The hydrangeas are still lovely, though. I planted three 'Nikko Blue' hydrangeas across the back of the space, so that in the summer it'll make a wall of pretty blue blooms. They are all fading into their fall colors now, but I still think they're lovely. I won't deadhead them until they've gone completely brown. Sometimes not until Spring. I just make sure to watch and prune above the new buds, and I always have plenty of flowers. We often have a fairly sunny autumn, but this year seems like it might go straight to winter -- for us that means rain. I don't know if I'll get another chance to sit out in the sun this year. That's okay. I've got plenty to work on inside, and besides, that's what rain gear is for, right? 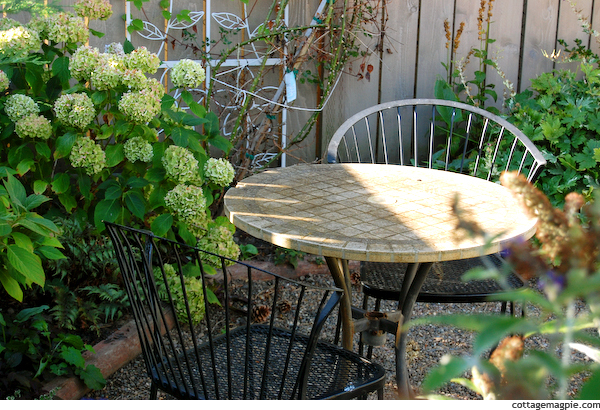 Do you have a cozy spot in your garden that beckons on a sunny fall day?